Is Senator Hutchison Running for Governor of Texas? Coy has been U.S. 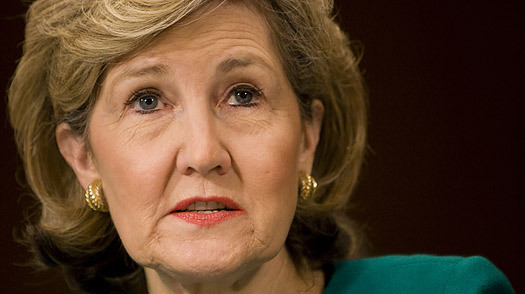 Senator Kay Bailey Hutchison’s middle name ever since she floated the notion that she might challenge fellow Republican Governor Rick Perry in the Texas gubernatorial race. She made hints about the 2006 race but backed off, then did the same for the one coming in 2010. On Wednesday, July 29, after months of will she/won’t she, Hutchison went on a Texas talk-radio show and stated in a formal announcement that she would launch her campaign in August and leave the Senate in “October or November.” But just as suddenly, as the news spread through Texas political circles, Hutchison held a press gaggle in Washington and confused the picture. Hutchison told Capitol Hill reporters she would not announce her departure date because “I am trying to fulfill my responsibilities here before I leave.” Besides, she suggested, things would work out a whole lot better if Perry would just declare he is not running, and then she could stay in Washington and still run for governor. Some reporters interpreted her remarks to mean she might not quit if Perry insisted on running, but Hutchison’s political staff quickly stepped in to say that her earlier statement on Texas talk radio ruled. As for Perry, it’s always ladies first. In June he suggested that instead of him giving up his hopes for another term, Hutchison might abandon her bid for the governorship. A battle between Perry and Hutchison would be epic  both have deep support in the state, have raised big bucks and have served for years. Recent polls, however, have given an edge to Perry, whose Washington-bashing appears to be resonating with Texas primary voters. For her part, Hutchison is scooping up some of Perry’s longtime major contributors.